Our first clash of round seven saw North City take on bottom of the table St Johns who were still searching for their first victory of the season. They took a step forward to achieving that goal when Monique Kolyvas opened the scoring, and they soon had a two goal advantage when Anthea Kordas found the net as three points looked as if it was becoming a reality today. A good interception from Michelle Vidanoski saw her finish off the chance to halve the deficit, before first gamer Janelle Sammut struck again to have the scores level at the break. The half time break was a good chance for St Johns to re-group and they answered back in style as Kordas got her second of the game to restore the St Johns lead. Kordas then struck again from close range to complete her hat trick as St Johns had their two goal buffer back and would look to add to it. A stunning long range strike from Vidanoski had North City within one as they saw a few efforts rattle the upright to give St Johns a nervy finish to the game. It wasn’t to be though as St Johns hung on for their first win of the season which has been a long time coming to say the least. 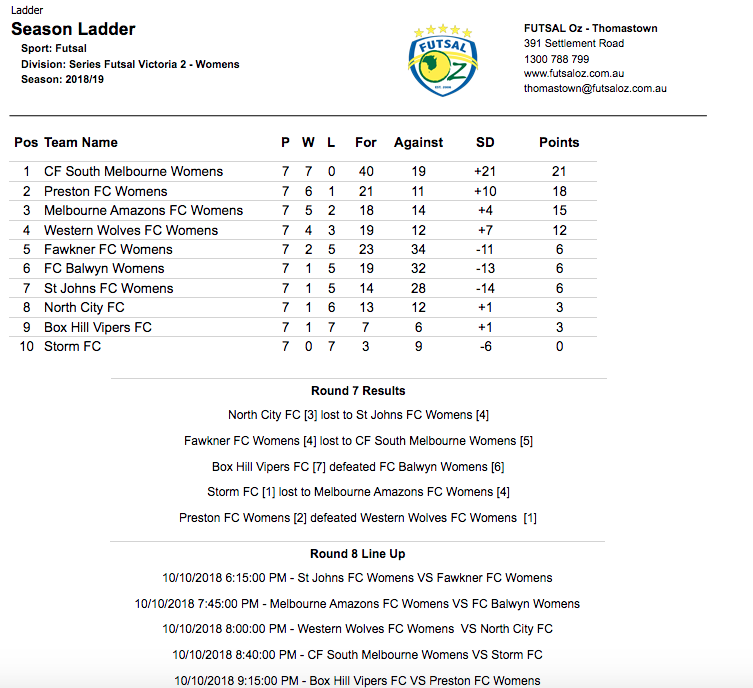 Next up we saw Fawkner who were looking to make it three straight victories take on ladder leaders South Melbourne who sat top of the table and undefeated. South opened the scoring through Corina Jayasekera for a good start to the contest, before Jayasekera netted again shortly after to have South leading by two. Fawkner found the net deep into the half through Izzy Swift to halve the deficit and go into half time trailing 2-1. Early in the second half South added to their lead as in form Nat Italiano added two quick goals to extend the lead to 4-1 and give South the breathing space they were after. 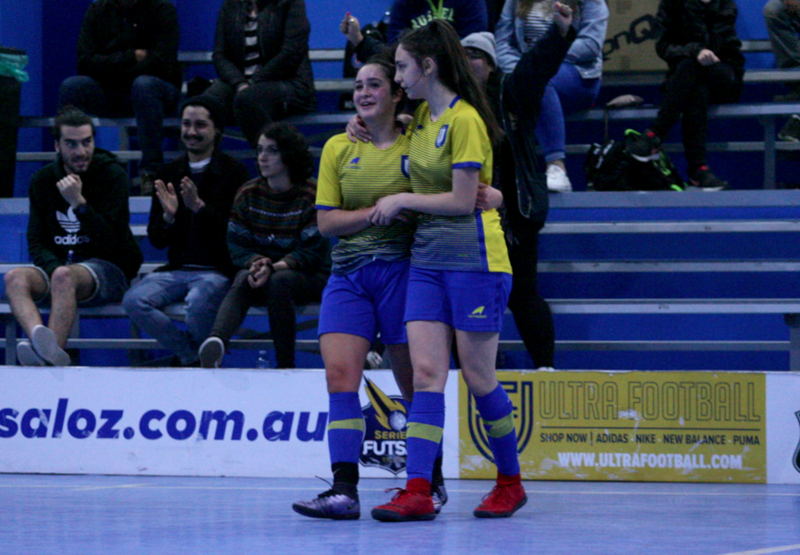 Laila Abdullatif pulled one back for Fawkner as they looked to mount a comeback, but it was all but put to bed when Rachel West found the net for a 5-2 lead. 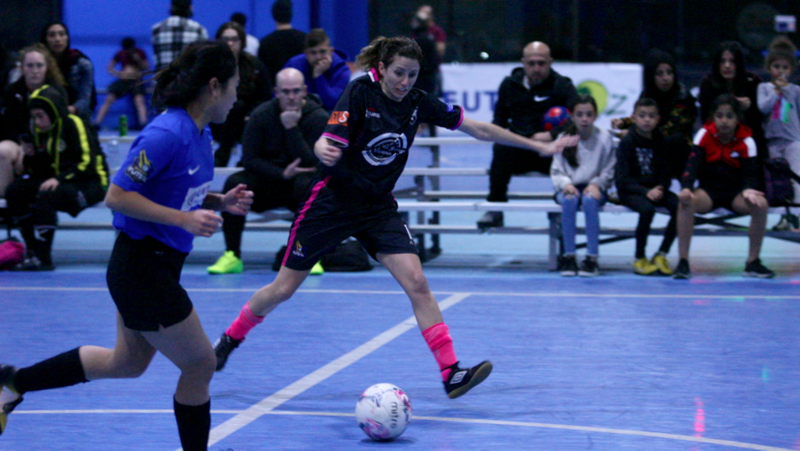 However Fawkner were not going down without a fight as Alana Cerne struck from the resulting kick off from near on half way to keep her side in the contest, and they had a chance to send the game to penalties when Aaliyah Erafei netted from a tight angle to have Fawkner within a goal late in the piece. South held their nerve though and despite it not being their most convincing win took home another valuable three points. Next up saw newcomers to the league Box Hill face a Balwyn side who were improving with every game. In a tight first half Balwyn would edge the scoring with a brace to Anna Liacopoulos helping them to a slender 2-1 lead with Priya Nataly finding the net for the Vipers. Box Hill had enough in the shootout converting their three attempts, while Balwyn missing their first shot put them behind and they could never recover as Box Hill record their first win in the league. 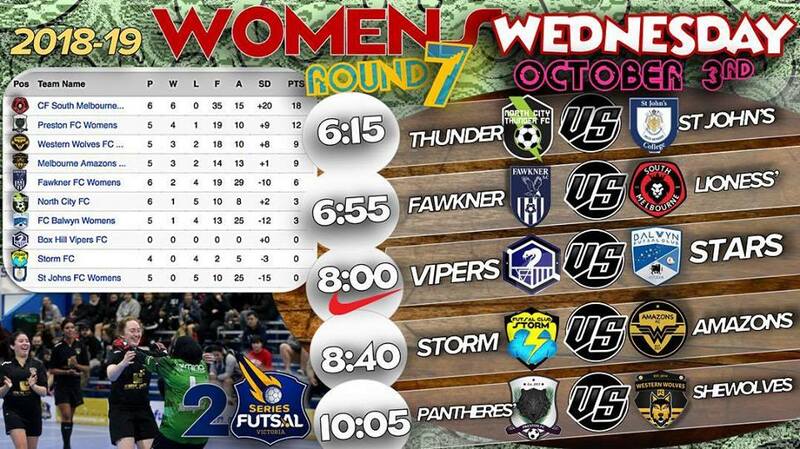 Next up saw Storm FC searching for their first win up against title hopefuls Melbourne Amazons. It was a strong start for the Amazons as they opened up a very handy 3-0 lead at the half time break with Buggraaf, Dupont & Longo all finding the net to give Storm work to do in the second half. Storm stemmed the flow of goals in the second half keeping the game goalless for over ten minutes, before finding the net themselves thanks to a Jessy Nguyen strike to give them a chance of a comeback. The game was put to bed however after a stunning strike from Zoe Dupont made it her second of the game and sealed an important win for the Amazons. The final game of the evening pitted second placed Preston against third placed Western Wolves in a crucial game early in the season. A very tight and tense first half saw both sides defending very well and as a result neither could find the back of the net as we went into the half time break deadlocked at 0-0. Preston would finally get the breakthrough midway through the first half as some lovely play saw Elizabeth Eyar find the net to open the scoring. 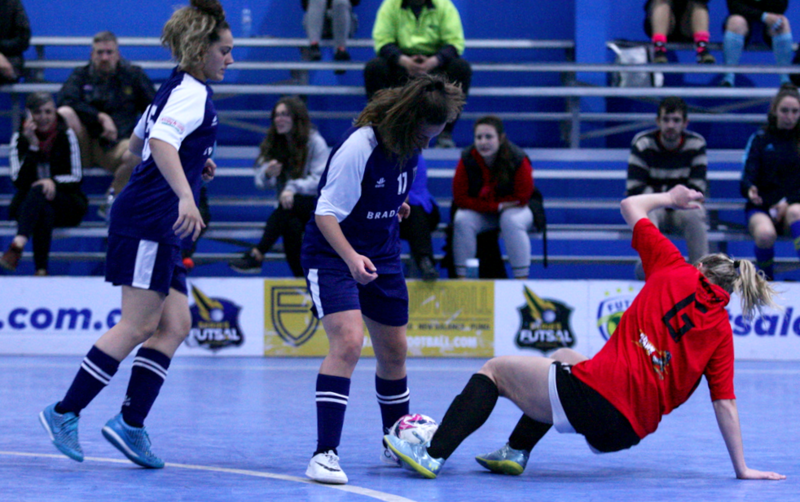 The Wolves hit back on the counter and Finley Nobbs would find the net as she brought her side back on level terms. Plenty of fouls were being given away by both sides and both notched up give fouls, the Wolves conceding a ten meter penalty which Eyar stepped up and converted as it proved to be the winning goal as Preston record a vital win to keep pace with South Melbourne, as the Wolves fall short in yet another close encounter.